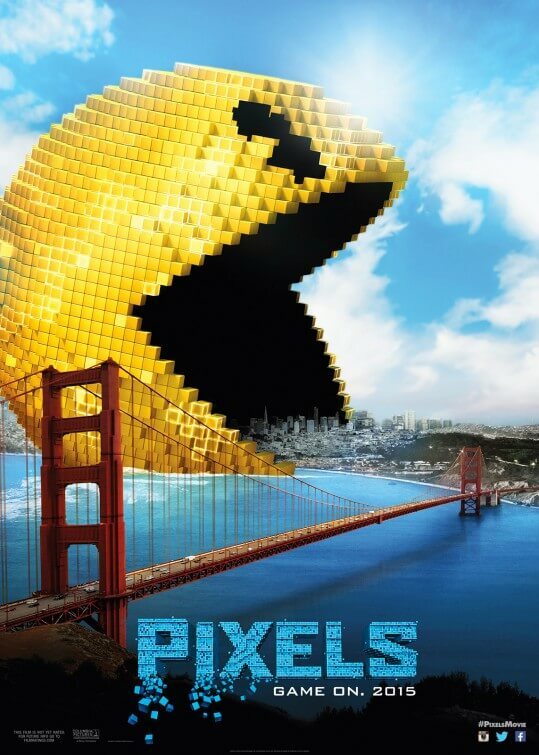 The thing about Pixels is, the premise is actually rather cool. Sure, it’s another alien invasion movie like the dozens we’ve seen before, but having the extra-terrestrials take on the form of 80s video game characters like Pac-Man, Donkey Kong and others gives it a retro and even promising vibe. After all, who doesn’t want to see that big yellow sphere devour cities like they were those ghosts, or Tetris blocks demolish actual buildings? Based on the short film by Patrick Jean, which you can check out at the bottom of this page, it has the makings of a silly but enjoyable blockbuster with fond memories of gaming history. And then Adam Sandler shows up. It’s clear, with his recent line of box office and critical disasters like Jack and Jill, That’s My Boy and Blended, that audiences have finally gotten sick and tired with Sandler’s usual schtick, with even his more serious ventures like Men, Women and Children and The Cobbler getting a savage beating by anyone that comes by them. People have grown out of the status quo, much more so than Sandler and his production company Happy Madison seem to have, and Pixels is the one that not only cements his fall from grace but is also the biggest missed opportunity to perhaps salvage his movie career. To give you a gist, Sandler plays Sam Brenner, a home entertainment installer who was once an arcade game champion as a kid. When an alien force misinterprets an 80s time capsule, which includes various video games from the era, as an act of war, President Will Cooper (Sandler regular Kevin James) calls upon his childhood friend Sam and a group of retro gamers including conspiracy theorist Ludlow (Josh Gad) and mullet-donning bad boy Eddie Plant (Peter Dinklage) to play for the planet. Even with a set-up as silly as that, Sandler and company somehow find a way to make it all even dumber, and not the good kind. The same type of idiotic humour that one usually associates with a Sandler movie is present and correct here, which includes a lot of people shouting their lines as if they think that’s what will make it funnier, ethnic stereotyping of different cultures that don’t even make sense, casual sexism – which this article from Vanity Fair words much better than we ever could – and insult humour which the film thinks is charming but is actively aggressive and nasty. Some of the jokes don’t just fall flat, they create giant plot holes in the story as a whole; for example, we learn early on (for “hilarious” effect) that James’ Commander in Chief is actually illiterate and can’t even read to a class of children, which begs the question: how did he ever become the President of the United States if he can’t even read to save his life? Surely, that is a pretty huge requirement for this kind of job; after all, it’s only leading the biggest country on the planet as Head of Friggin’ State. It’s one of the many contrivances that this film thinks it can get away with because it actually thinks we are as dumb as this guy – though to be fair, it is a better role for James than Paul Blart: Mall Cop 2, although that’s not saying much. Speaking of performances, here’s another missed opportunity for Sandler. His rare departures from outright comedy such as Punch-Drunk Love and Funny People have proved that, given the right director and script, he can actually deliver a good performance every now and then, and even in some of his earlier work like Happy Gilmore or The Wedding Singer he’s not that bad. But here, he’s just awful. Every delivery of dialogue he gives feels like he’s incredibly bored and wishing he were somewhere else, and not for a second do you actually believe that he’s at all invested in saving the planet from this giant threat. We have no idea if this is his attempt at dialling things down thanks to director Chris Columbus, but it’s still a bad performance. And yet, like most Happy Madison productions, the film still tends to serve Sandler’s ego by continuously portraying him as the greatest guy ever, in one scene literally having crowds of people cheering him on and making him the centre of attention. The levels of self-indulgence are extremely uncomfortable, especially when the person that the film is supposedly glorifying doesn’t even look that invested in anything. You have to give some credit to Peter Dinklage and Josh Gad, because at least they look like they’re having fun, although the latter is saddled with a conclusive pairing that is not so much funny as it is downright disturbing (the final “joke” before credits roll will give you nightmares from how you imagine its existence came into being). Even the cool premise is bungled; save for perhaps the Pac-Man sequence and a city-wide brawl of video game characters (which seems to be the one thing lifted directly from the short film), none of them seem to be given much life and usually fall victim to Sandler’s redundant sense of humour – if you’ve ever wanted to see a film where Q*bert actually pisses himself, then you’re in luck. The funny thing is, when it actually does focus on the various alien attacks, it’s at least interesting; almost nothing regarding the human characters, in particular Sandler, is even worthy of interest. Unfortunately, there’s much more of the latter than the former, which means that for the most part it’s an extremely unengaging ride. This, however, makes it one of the biggest disappointments of the year. At a time when Sandler’s star is seriously fading, he desperately needs to find a way to reconnect with audiences and become popular again. Pixels perhaps served as the biggest window for Sandler to do just that, and he still buggered it up with the same problems that got him into this mess in the first place. It’s a miserable confirmation that Adam Sandler is now unsalvageable as a movie star, and it won’t be long before he’s a ghost ready to be eaten up by Pac-Man. It’s a seriously depressing “game over” for him now. Pixels bungles its cool premise with Adam Sandler’s stale Happy Madison tropes, but it’s the size of the opportunity that has been missed for Sandler to reinvent himself that truly makes this a disappointment. Just watch the original short film, we guarantee you’ll have a much better time.